We've been working hard on new membership options which will be coming this fall. Make sure you leave feedback so you can get your next free DVD. We value your opinions and do our best to customize each program for all classrooms. In the past, we've actually redone a program based on teacher feedback, so know that your comments are read and carefully considered. Along with that, we also have several upcoming new releases that you can look forward to selecting as your Free Annual Video. Stay tuned! 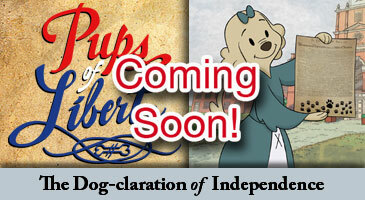 On our social media, we've been sharing clips of our new program, "Pups of Liberty: The Dog-claration of Independence."